The hands can age more quickly than the rest of body. The reason is that they are exposed more frequently to chemicals and dirt, which can be associated with bacteria. Also sun rays speed up their aging. If the care is totally neglected hands can reveal nearly everything about their owners. We can stop aging of hands with specific cosmetic care and regular use of cosmetic products with the emphasis for sun protection. There are also available different "lifting therapies" with cosmetics of Orlane which are very popular. Some favorites include a special regeneration cream wrap with antistress massage, which is helps the vascular and lymphatic systems. 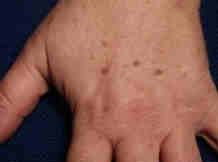 The signs of aging of hands are diminished by therapy with a laser gel mask in combination with biostimulation laser. This gel has a high hydration ability and helps to regenerate and clean the complexion. The red light of the biostimulatory lamp also calms skin of hands, smoothen it and removes small defects. The main effect is the stimulation of the new collagen within the skin. Also helps to make hands looking younger. The visual effect is "peeling like" and it provides the new look of the complexion. It is also helpful in the restoration of damaged nail beds. Many people all throughout New York and Brooklyn have discovered the benefits of our treatments.